Different jockeys, different surfaces, even different countries – but the same results. Uncaptured has vaulted to the top of the 2013 Kentucky Derby futures market at 14-1 with his impressive performance on both sides of the 49th Parallel. Aside from the fifth in his last race up north at Woodbine, it’s been a clean sweep for Uncaptured. Jockey Patrick Husbands was on board for all five races at Woodbine and lodged an unsuccessful complaint after the Grey Stakes, claiming that Uncaptured (the 2-5 favorite) was impeded in the straight by eventual winner River Seven. Consider that result an anomaly. As well as Uncaptured performed at Woodbine, he’s been even better at Churchill Downs – which is fantastic news for horse players betting on the Kentucky Derby. With Miguel Mena as his new jockey, Uncaptured crushed the field at the Iroquois Stakes, a field that included Kentucky Derby contender Overanalyze. 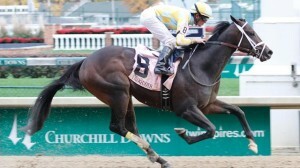 Then Uncaptured took the Kentucky Jockey Club Stakes by a head over Frac Daddy in an engaging duel down the stretch. Uncaptured, as you may have guessed, is a Canadian-bred horse, foaled on March 19, 2010 at Windhaven Farms in Ontario. Windhaven is owned by noted breeder Bill Graham, who was also a hugely successful businessman and a multi-sport athlete, playing tackle (both ways) in the Canadian Football League from 1959 to 1961. Uncaptured’s sire was Lion Heart, who finished second to Smarty Jones at the 2004 Kentucky Derby and fourth at the Preakness. Lion Heart had a number of successful breeding seasons – five, to be exact – before being sold to interests in Turkey in 2010. His first crop included 2010 Breeders’ Cup Turf champion Dangerous Midge; Uncaptured is from his fifth and last season, which also produced grades stakes winner Know More. Uncaptured’s dam was Captivating, who herself is the product of the respected broodmare sire (and 1998 Super Derby winner) Arch. John Oxley was able to purchase Uncaptured as a yearling for $290,000. Oxley is best known as the campaigner behind 2001 Kentucky Derby champion Monarchos, the only other horse besides Secretariat to finish the race in under two minutes (1:59:97). Oxley, an Oklahoma oil-and-gas man who comes from a polo-playing family, also owned 1999 Ladies Classic winner Beautiful Pleasure. Oxley and trainer Mark Casse have enjoyed tremendous success recently with juveniles, especially Canadian-breds such as 2010 Sovereign Award-winning filly Delightful Mary. Casse has told reporters that he plans to race Uncaptured at the Grade 3 Sam F. Davis Stakes and the Grade 2 Tampa Bay Derby before leaving Florida and returning to Kentucky.